Human capital theory and the life-course perspective are used to investigate how economic modernisation, as well as developments in the labour market after the West German “economic miracle”, impacted employers’ supply of further education and training on the job, and employees’ increased participation in these arrangements. Additionally—controlling for the aforementioned structural change and economic cycles—it is analysed whether participation in further training minimises employees’ risk of dismissal and heightens their commitment to a company. The hypotheses are tested using longitudinal data and time series—allowing the analysis of employees’ participation in further education and training on the job, and the careers of West Germans born between 1956 and 1978 for the 1972–2008 periods—by procedures of event history analysis and episode splitting in a dynamic multi-level design. Systematic period and cohort effects of structural change in the economy and labour markets on companies’ supply of, and employees’ participation in, continued vocational training on the job have been revealed. Participation in further training reduces employees’ risk of dismissal, as well as their mobility between companies. Participants’ adaptation to structural change via job-related further training is correlated with increased employment security, professional flexibility, and commitment to the employer. Since the 1970s German employment research has told the story that investment in further training on the job is essential to ensure the firms’ economic competitive ability and to secure the employees’ occupational qualifications (Becker 2018; Solga and Becker 2012: 13–14; Buttler 1994; Buttler and Tessaring 1993; Hartung and Nuthmann 1975: 12; Sass et al. 1974). They also argue that the increasing internationalisation of goods and labour markets, the persistent scarcity of manpower, the occupational, economic, and technological change, the ever-growing occupational qualification requirements, as well as demographic change, and the declining supply of a qualified labour force (Gerhards et al. 2012; Neubäumer 2008; Büchel and Pannenberg 2004; Buttler and Tessaring 1993; Dostal 1991; Sass et al. 1974: 43) make professional development by permanent further training in the course of an individual’s working life and in firms indispensable (Autorengruppe Bildungsberichterstattung 2014: 139; Yendell 2013; Organisation for Economic Co-operation and Development (OECD) 2012; Bundesministerium für Bildung und Forschung (BMBF) 2011: 72; Bellmann et al. 2010: 43; Schiener 2006: 127). If the ‘half-life’ of initial formal education and training in the life-course (Schömann and Leschke 2004: 361), as well as the quantity of qualified entrants (Becker and Blossfeld 2017), continues to sink drastically so that the demand for a qualified labour force can no longer be satisfied by the recruitment of subsequent cohorts of novices, then investing in further training opportunities for experienced staff seems to be an effective and efficient strategy to manage these upcoming challenges (Bellmann et al. 2014; Weiss 2011: 369; Büchel and Pannenberg 2004). In the course of this economic modernisation, and due to its consequences for labour markets and jobs, employees are forced to engage in on-the-job further training in order to maintain their occupational skills, to improve their existing qualifications, to secure occupational opportunities (as well as earnings), to expand their job options, and to protect themselves from the negative consequences of structural change (Schömann and Becker 1995; Büchel and Pannenberg 1994). Employers find themselves in a very similar situation. Activating the available potential of human capital is seen as a necessity to increase productivity and to adapt to the changing requirements of modern technology, as well as to the changing nature of production and work processes initiated by significant long-term economic modernisation (Pischke 2001: 524). As plausible as these relationships and related claims seem to be, there is no empirical evidence for them over a long historical period of about 30 or 40 years. Therefore, from the perspective of life-course research (Mayer 1990, 2009), this contribution analyses whether structural change in terms of economic modernisation and economic cycles since the 1970s in West Germany, with their effects on the labour market situation, are followed by further training investments by employers and employees. What are the effects of the rising importance of information and communication technologies, the increasingly service-oriented labour market, the increasing learning and process orientation of modern work, and the possible workforce shortage as a consequence of demographic trends? Do developments in occupational structures lead to an increase in the employees’ participation in further vocational training in their employment history? Do changing labour market structures or macroeconomic cycles lead to an increase or decrease in employers’ offers of further training opportunities for their employees? Furthermore, the question arises whether these structural changes have an impact on the stability of individuals’ employment and their occupational mobility throughout their careers. Does continuous further training on the job prevent premature termination of employment? Does occupational flexibility grow with participation in continuous training in line with structural change, and does it facilitate the integration of the workforce in labour markets? Due to a lack of appropriate longitudinal data that would make it possible to address these questions in a comprehensive way (Lynch 1992: 299), event history data from the longitudinal ALWA study (Arbeiten und Lernen im Wandel) in regard to individual careers in West Germany from 1972 to 2008 are used (Kleinert et al. 2011; Becker and Blossfeld 2017).1 The remainder of the paper is organised as follows: the theoretical background and the hypotheses are presented in Chapter 2; Chapter 3 gives an overview of the data and variables, after which the design and statistical procedure are described; Chapter 4 presents and discusses the results of the analyses; and, finally, Chapter 5 provides a summary of the findings and a conclusion. If knowledge and skills in a working context must be acquired and renewed continuously due to changing occupational structures in the course of tertiarisation and continued technological modernisation (Becker and Blossfeld 2017; Oesch 2013; Schindler et al. 2011; Goldin and Katz 2009; Bills 2005; Büchel and Pannenberg 2004: 74), then from an employee’s perspective, the question arises as to who engages in professional development in terms of continued job-related training, and when and how often they do so in the course of an employment relationship—as well as under which circumstances and requirements (Becker 2018; Büchel and Pannenberg 1994).2 Controlling for individual resources and experience, how far does further training at the workplace depend on economic factors in terms of technological change or business cycles, labour market structures, and working contexts? What consequences do employees’ job-related further training have for their careers in the course of economic modernisation and changing labour market conditions? Are participants in further training courses at a lower risk of being laid off? Is their employment with one and the same employer comparatively more stable, due to adaptation to structural change in terms of economic modernisation and economic cycle? From the perspective of the company, employers are mainly gate-keepers as regards their employees’ opportunities to participate in firm-specific further training (Schiener et al. 2013). Who do employers invite to take part in further training courses? How far does this provision of further training depend on economic modernisation and business cycles? In the long run, can employers bind to themselves employees who have received further training even in the case of unfavourable economic developments or rapid change in job content and requirements? According to human capital theory (Becker 1975), employees are expected to participate in continuous vocational training in order to increase their productivity and to maximise their expected discounted life-time earnings (Mincer 1962). In particular, Mincer (1974) considers participation in further education and training across employees’ work life. However, beyond a certain threshold, human capital investment decreases in the life-cycle, due to diminishing time for the amortisation of the training costs. Such investment in human capital might be valid in times of economic modernisation and a changing labour market situation. Significant change in production and working processes (e.g. technological innovation, far-reaching organisational change), as well as in the professional activities (e.g. tertiarisation, digitalisation), requires employees to adapt to increased qualification requirements by acquiring new knowledge and skills on the job (Schindler et al. 2011; Goldin and Katz 2009; Acemoglu 2002; Schömann and Becker 1995). In this way, employees not only try to realise returns, such as higher earnings, promotion, more interesting professional activities or a more agreeable workplace (Büchel and Pannenberg 1994), but also to secure their jobs and the related benefits of previous human capital investments, among other factors. On the one hand, particularly in the course of the rapid and extensive technological change observed in the post-war period in West Germany (Blossfeld 1986; Becker and Blossfeld 2017), there is an increasing necessity for continuous human capital investments since the employee’s employment relationship becomes vulnerable due to inappropriate resistance to increasing qualification requirements in the same job. Therefore, it is assumed that the more pronounced the economic modernisation (e.g. tertiarisation, technological change, etc. ), the more likely it is that employees will participate in further training on the job (Hypothesis 1). On the other hand, for the case of West Germany, there is empirical evidence that even in the periods of significant economic modernisation, employees’ inclination to participate in further education is correlated strongly with changing labour markets conditions, depending on business cycles such as the recession after the so-called “German economic miracle” (1966–1967), the 1973–1975 and 1980–1982 recessions in the course of two oil price shocks (1973, 1979), and the latest economic recessions and crises (1991–1994, 2001–2003, 2008–2009) (Schömann and Becker 1995; Schömann et al. 1997; Becker and Schömann 2015). If their job is endangered because of an economic downturn and increasing unemployment then employees, among other things, invest in further training on the job in order to minimise the chances of facing redundancy and unemployment. In times of labour market recovery or a booming economy, it is not necessary for them to engage in further training in order to secure their jobs. That means that the less favourable the labour market situation (e.g. unemployment, failure of firms, etc. ), the more likely employees are to invest in further training on the job, while in an economic boom there is no necessity for them to engage in further training to secure their jobs (Hypothesis 2). In regard to job-related further training, employers offer training opportunities in order to meet their needs in terms of human capital and to enhance efficiency in production (Gerhards et al. 2012; Bellmann et al. 2010: 43; Neubäumer 2008; Schömann and Becker 1995: 188).3 This is why, in the face of economic modernisation and increased qualification requirements, they increasingly invest in further training arrangements—especially so as to secure and improve their competitive positions (Mühlemann and Wolter 2011; Weiss 2011). Evidently, these investments are more efficient and effective than extensive rationalisation of production and workflow, or the recruitment of novices. Therefore, it is assumed that the more pronounced the economic modernisation, the more likely it is that employers will offer their trainable employees a release from work for the duration of their further training, or financial support for their participation in further training (Hypothesis 3). Because of the costs involved in further training, larger—and thus usually financially more sound—companies are more capable of making such investments (Bellmann et al. 2014; Gerhards et al. 2012; Bellmann et al. 2010: 46–47; Neubäumer 2008: 35; Wolter et al. 2006). If they experience economic hardship as a result of recession then it is to be expected that they will reduce spending on professional development opportunities (Bellmann et al. 2014: 14–15; Dietrich and Kruppe 2009: 259). Due to their reduced ability to pay for costly within-firm further training arrangements in periods of economic downturn, however, small companies are expected to completely desist from investing in continuous vocational training on the job (Schömann and Becker 1995). Overall, for economic reasons, this leads to a decline in their employees’ opportunities for further training, compared to employees’ chances in bigger firms. As a consequence, in an economic downturn, a majority of employees find themselves without supplementary or new qualifications which have by that time become necessary. Consequently, companies are forced to invest in their employees’ further training in times of increasingly favourable economic cycles and labour market situations in order to meet their increasing demand for qualified manpower. Therefore, the more favourable labour market conditions become in the course of an economic upturn, the more likely it is that employers will offer further training opportunities (training leave and financial support) to their employees (Hypothesis 4). As already mentioned, employees could feel motivated to participate continuously in further training in order to guarantee their prospects of receiving benefits by improving their ability to react to the consequences of technological change (e.g. automatisation or rationalisation) (Schömann and Becker 1995; Becker and Schömann 2015), or, at least, to maintain their employment status in times of economic recession (Schömann et al. 1997; Becker 1991, 1993). Their ability can be measured indirectly—apart from returns in terms of prestige (Blossfeld 1986), income (Hannan et al. 1990; Becker and Schömann 1996) or job security (Schömann et al. 1997)—by increasing rates of job change in their work history, i.e. change to another job that is more appropriate in the light of the human capital that has been improved by further training on the job (Becker 1993: 78). Therefore, it is assumed that participation in further training on the job increases employees’ probability of changing their job—e.g. if structural change provided the main motivation for further training (Hypothesis 5). Furthermore, employees are usually expected to prefer general further training, as opposed to on-the-job further training, since the latter commonly focuses on firm-specific human capital which not only cannot be fully used in other companies, but is also seldom certified and as such is rarely acknowledged by other employers. Therefore, participants of further training courses are only expected to change employer when they are faced with more lucrative professional alternatives in another company. According to Acemoglu and Pischke (1999), the current employer has monopsony power over the employee trained within the firm, due to mobility costs. As a consequence, benefits will increase more with a change of employer; this could be an incentive for participants of further training courses to quit their current job. However, due to the asymmetry of the information held by the future employer regarding the eventually increased productivity of these participants, within-firm further training could be more likely to be rewarded in an employee’s current job than in an outside firm (Booth and Bryan 2005: 391). Provided that the within-firm further training is not accredited or certified, this might increase the participants’ stability of employment in their current company (Becker 1993). Due to their firm-specific human capital, their probabilities of changing employer are lower than for non-participants (Hypothesis 6). In order to secure long-term profits, considering the costs and benefits of further training arrangements (Wolter et al. 2006), and to ensure a lasting employment relationship (Schömann and Becker 1995: 190), the knowledge and skills conveyed in on-the-job further training courses are mostly firm-specific (Neubäumer 2008; Acemoglu and Pischke 1998). Therefore, qualified employees—especially employees in management as well as qualified commercial and technical employees, qualified craftsmen, and skilled workers—are more often offered opportunities for further training (Schiener et al. 2013; Schömann and Becker 1995; Becker 1991). This is a way of binding these employees to the company (Mühlemann and Wolter 2011). In order to prevent them from giving notice or being lured away by other companies, employers can oblige them to repay the costs of the further training courses if they leave prematurely (Leber 2000). Because this ensures that the costs and returns of further training are divided between the individual and the company, at least one party—employee or employer—has no interest in (prematurely) dissolving the employment agreement (Booth and Bryan 2005: 391). In the case of imminent redundancies in the company, internal considerations will lead to a higher probability of being laid off for non-participants of further training courses compared to those who have participated (Büchel and Pannenberg 2004: 79). Participation in on-the-job further training reduces employees’ probabilities of giving notice—as it does employers’ propensity to lay them off (Hypothesis 7). This is for reasons of profitability and also holds good regarding the termination of an employment contract by mutual agreement. The longitudinal data analysis is based on event history data from the ALWA study (Kleinert et al. 2011). Meanwhile, the ALWA survey has been integrated into the German National Educational Panel Study (NEPS). The ALWA data were collected between August 2007 and August 2008 on behalf of the Institute for Employment Research (IAB) in Nuremberg.4 The data set contains information on more than 10,400 life courses of people living in Germany who were born between 1956 and 1988. It allows longitudinal analysis of individuals’ different life areas, such as school education and training, careers, and professional development. The target subjects were drawn randomly from the population register of 250 communities irrespective of their spoken language, nationality, and employment status. They were interviewed by computer-assisted telephone interviewing about their life courses (Gilberg et al. 2011). In regard to the initial sample, the response rate was around 46% and 10,177 longitudinal data sets were realised. Information on the life courses were collected retrospectively (Mayer 2008). This means the respondents were asked to reconstruct their life in various fields such as education, training, and career. With such a method recall errors might be expected when the time-interval between the interview and the occurrence of a specific event was great. Although the reservations to the reliability of retrospective data seem to be plausible, they are not confirmed empirically (e.g. Becker 2001: 33; Schömann 1994: 160; Blossfeld 1987a). However, to the contrary, institutionalised states and events, such as education and training, are usually memorised in a quite reliable manner (Reimer 2005; Brückner 1995). Furthermore, several studies demonstrated that the reliability of retrospectively recorded data about objective life histories is not systematically affected by a lack of ability to answer questions or deficient memory capacity (Mayer 2008; Brückner 1995). They indicated that, while the possibility of recall errors was minimal, the form and precision of the survey instrument proved to be of key-importance with respect to the quality of the responses. In order to minimise possible memory problems, as well as to maximise the validity and reliability of the information, especially in regard to time references and the sequence of episodes, special techniques were used to support the memory process of the interviewees. As an example, in the modules on life areas such as working life, autobiographical cues were presented and already available information was used for filtering. Additionally, a tool for checking and amending data for temporal consistency was used in the computer-assisted telephone interviews. Finally, an intensive editing process and a close inspection of the information on the life courses in respect to chronological consistency vouch for the quality of the data (Matthes et al. 2012). Previous comparisons of microdata with aggregated time series data from official statistics demonstrate the high data quality of the retrospective event history data on educational and occupational trajectories (Becker and Mayer 2019; Hannan et al. 1990; Blossfeld 1986). The analyses are confined to employed persons who were born in West Germany between 1956 and 1978 and for whom data were complete, with exact time specifications for the beginning and end of occupational episodes. Only professional activities with more than 10 working hours per week are considered. Secondary employment, internships, and voluntary work are excluded from the analyses. Considering the particular developments after the collapse of the GDR, Eastern Germany is not included. However, data on further training while in paid employment were collected without exact time specifications for the beginning and end of participation. Thus, the exact timing, order, and duration of the employees’ participation in further training courses during a job episode are unknown. To solve this problem of missing time references, a random time reference for the beginning of a further training course in an employment episode is estimated (see also: Schömann et al. 1997). However, almost two-thirds of employed participants have attended more than two courses, meaning the actual activities are underestimated. On the aggregate level, the participation rate for the time period between 1970 and 2008 would in this case be under 10%. That is clearly under the level of up to 50% reported in other studies (Becker 2018; BMBF 2015; Becker and Schömann 2015; Autorengruppe Bildungsberichterstattung 2014; Hubert and Wolf 2007; Schömann and Leschke 2004). For this reason, the following strategy was chosen: first, the year in which professional development activities were taken up for the first time is estimated for all participants of further training for the time interval of an occupational episode. Second, for the remainder of a specific employment relationship, it is then assumed that a previous participation in further training reflects the permanence of human capital acquisition through courses. A sequence of courses counts therefore as one educational episode since the majority of further training courses are attended consecutively and build upon one another (Büchel and Pannenberg 2004: 77).6 This solution to the problem of missing time references leads to significantly more consistent findings compared to the assumption of singular participation in employment episodes (see also: Böhnke 1997). The results also coincide with the findings of previous analyses with retrospective event history data, such as the German Life History Study (Becker 2018: 326–328; Becker and Schömann 1996, 2015; Becker 1991, 1993). Concerning the effects of professional development, people are reported to have participated in further training from the estimated time point of the first course onwards. During one and the same job episode, a person is thus first counted as not in further training for a while and then changes to the condition of professional development participation. In this way, the time variance of the condition of further training participation versus no participation can be related to the stability of the further employment history as a consequence of the further training (Becker and Schömann 2015). Needless to say, this procedure has methodological failings and shortcomings in regard to content, which, in the face of a lack of alternatives, or alternatives which are associated with even more problems, must be accepted. Participation in further training courses in a job episode (further training on the job) as a first dependent variable has been discussed in detail above. To validate the possibilities of being able to participate in further training arrangements during a job episode, further training offers of the employer are included in the form of two further dependent variables. One variable indicates the current employer’s proposition concerning paid time off for the attendance of courses (training leave) and the other indicates the employer’s offer of financial support for professional development (financial support). These dependent variables are used to estimate the probability of having the opportunity to engage in professional development. Effects of previous further training on the patterns of occupational careers are operationalised with five further dependent variables. The first is the risk of being laid off by the employer; the second is the employees’ dismissal by the employer; the third is the mutually agreed termination of employment; the fourth is the change of employer; and the fifth is a change of a job during the career, indicated by a changing professional activity or a shift to another workplace. The change of professional activity is operationalised by a change of the three-digit-ISCO (International Standard Classification of Occupations) value: this means a change of this value or the workplace defines the end of a job spell and the start of a new job episode (Becker and Blossfeld 2017; Blossfeld et al. 2007; Blossfeld 1986). The fourth and fifth dependent variables are both well-established indicators for job mobility as a consequence of participation in further training (Becker 2018). The choice of independent variables is driven by theoretical considerations and empirical evidence. An important independent variable is the educational level of employees. From the point of view of human capital theory, school and vocational training degrees can be rank ordered. The following categories of schooling are defined: no graduation, secondary education certificate (either basic or advanced level), and higher education entrance qualification. Degrees of vocational training are categorised as follows: no certificate, vocational education and training (e.g. apprenticeship, technical college), higher professional education (e.g. master craftsman, engineer), and graduate degree (e.g. university diploma, Ph.D.). The categories of general education and vocational training are combined according to the CASMIN (Comparative Analysis of Social Mobility in Industrial Nations) educational classification (Braun and Müller 1997). The combined certificates were ordered hierarchically according to the average duration of achieving them, as well as to the significance of their returns on the labour market. In line with human capital theory, greater weight can also be assigned to higher educational certificates in respect to productivity and trainability than to educational levels. The class position of the individuals throughout their careers (i.e. their position in the hierarchy of the company being their place of employment or the relationship between an employer and employee) is measured by the German Employment Class Schema (GEC) suggested by Mayer and Aisenbrey (2007: 132). In this context the hierarchically aligned categories—working class, lower middle class, middle class, and upper service class—are differentiated between.7 In the analysis of continuous participation in further training, this classification is well established (Becker and Schömann 2015). Concerning the qualification requirement of the workplace, high—that is, requiring at least a completed apprenticeship—and low (no prior training necessary) requirements are differentiated. As a labour market characteristic at the meso level, firm size is used to indicate the economy of scale, use of sophisticated technology, and need for enhanced skills measured by the logarithm of the number of employees at the interviewees’ place of work (Bills 2005: 76).8 The employment in public service (vs. employment in the private sector) is an additional indicator of the labour market structures and opportunities of further training that are important for the German case (Becker 1991, 2007). Understanding why and how the trend of economic modernisation and the change of the labour market situation initiated by business cycles have significant effects on occupational careers and participation in further training cannot be achieved in a comparative-static way (Blossfeld 1996: 198). Such a dynamic multi-level framework has to recognise that time matters for the linkages between these levels. Participation in further education in individuals’ occupational careers are processes that are shaped by modernisation (macro level), by the life-course and organisational ecology of firms demanding skilled employees (meso level), and by purposive individuals (micro level). In addition to these analytical levels, different time dimensions have to be taken into account in order to understand the dynamics of economic modernisation and labour markets, and their impact on careers and further training. At the start of their occupational career, employees starting their career in given years share contexts such as the trend in and level of modernisation (cohort effects). However, these effects are not restricted to their initial impacts: in addition to such cohort effects, they also affect patterns of career and opportunities for further training at later points in the educational career (period effects). Finally, occupational mobility and enrolment in further training are enacted by individuals’ cumulative experiences in the institutional setting of firms and labour markets (age effect; life-cycle effect). In order to carry out an age–period–cohort analysis in a dynamic multi-level design, the procedure suggested by Becker and Blossfeld (2017) is used. In order to reveal the effects of structural change in terms of economic modernisation, official time series have been employed. For each of the calendar years, these data indicate the level of modernisation—measured by the employment rate, share of employment in the primary, secondary, and tertiary sectors, size of the labour force, GDP (gross domestic product), and GDP per capita. They also contain information on the labour market situation—indicated by the (negative) unemployment rate, the number of vacancies, and the number of companies.10 In order to solve the identification problem caused by strongly correlated or not very informative time series, a confirmatory factor analysis on these 10 time series has been utilised. The principle component method and orthogonal rotation of the factors produce two theoretically driven factors: economic modernisation (e.g. technological change, tertiarisation process, etc.) and labour market situation (e.g. unemployment, job opportunities, etc.). These two factors explain almost 92% of the variance in the 10 different time series (Table 1). This enables us to envision the trend of economic modernisation and the development of the labour market situation affected by economic business cycles. The factor values for the time span of interest here (1971–2008) are depicted in Fig. 1. They reflect the structural change in the economy since the end of World War II and, in particular, after the end of the ‘German economic miracle’ (Blossfeld 1986). A linear trend of economic modernisation varying with economic cycles can be detected. The development of the labour market situation is rather cyclical, following the ups and downs of the business cycle. The combination of the time series data at the macro level and the data on occupational career and further training at the micro level is realised by the method of episode splitting (Blossfeld et al. 2007). Each of the original job episodes has been divided into yearly sub-episodes and linked with the corresponding factor values for the respective time span (Becker and Blossfeld 2017; Blossfeld 1986). At the beginning of each sub-episode, the balance of the factor values for the economic modernisation, as well as the labour market situation of the respective year and the year before, is used to construct the period effect. The period effects measure the proximate, short-term impact of structural changes on occupational and further training trajectories throughout the historical trend; they depict macro changes as an exogenous impact on the employees’ expectations and actions in their careers.11 Therefore, the macro change can be modelled as an explanatory influence on the employees’ inclination to participate in continuous vocational training on the job, and the effects thereof on different stages in their occupational career (Blossfeld and Rohwer 1997). Furthermore, the factor values of the so-called cohort effects are included in the analyses in regard to participation in, and the effects of, further training. Generally, they indicate more distant effects of the modernisation trend and change in the labour market situation on the shape and dynamic of further training in the work history. The historical year in which interviewees first enter employment is replaced by the respective factor values at the start of that year. These cohort effects are important for the dynamic analysis of the employees’ participation in further education and the consequences of previous further training on their consecutive occupational careers because the conditions at job entry have middle- and long-term effects on the different events in their professional careers (Blossfeld 1987b; Schömann and Becker 1995): the more favourable the work situation at the time of first employment, the more likely it is that the beginning of the individual’s working life will be successful and the more successful their further occupational career is likely to be (Mayer and Blossfeld 1990). As a consequence it can be assumed that conditions at the start of an individual’s working life have long-lasting effects on the probabilities for further training and job changes—even when controlling for previous professional development activities (Becker and Blossfeld 2017). Participation in further training on the job and its consequences in regard to the subsequent career are considered as stochastic processes in the institutionalised settings of firms and labour markets varying across time. Therefore, for the estimation of the inclination to participate in further training during employment or the effects of preceding professional development on the stability of the occupational career, the statistical procedure of event history analysis is applied (Blossfeld et al. 2007). In the logic of dynamic multi-level analysis, it is possible to model time-dependent characteristics of the macro and meso levels as predictors for events at the individual micro level by utilising these parametric procedures (Blossfeld 1996). In this respect, for one thing, the dependent variable is the probability of engaging in further training and, for another, the probability of gaining an advantage for one’s career through further training. These respective probabilities are estimated by the rate r(t). This rate is understood as the marginal value of the conditional probability of an event—such as further training participation, layoff, or firm change—in the time interval (t, t + Δt), provided that the event has not occurred before. In the case of transition to further training, this rate is estimated on the basis of the Gompertz distribution. The estimations of the consequences of further training are based on an exponential distribution. In combination with episode splitting and time-varying indicators at the macro, meso, and micro levels, it is possible to estimate the likelihood of participation in further training and its consequences for outcomes in the occupational career by taking the cohort- and period-specific impacts of economic modernisation and labour market conditions into account. In regard to estimations of the effects of participation in further training on the career, the selection problem often emerges (Becker and Schömann 1996, 2015). This is mostly the case because it is often not possible for researchers to allocate interviewees into the conditions of “participation” versus “non-participation” randomly and in a controlled manner (Morgan and Winship 2007). The processes of employees’ self-selection and selection by others, such as employers, determine the assignment of the treatment as well as the probabilities of participating in such programmes systematically. This selectivity bias usually leads to biased estimates since each of the effects of the programme are not identical to the differences of the result variables for participants and non-participants (Winship and Sobel 2004). However, in contrast to comparative-static estimations, it is possible that this selection problem could be minimised by applying the method of episode splitting (Blossfeld and Rohwer 1997). On the one hand, the very same people can be observed over a longer time horizon (work experience, belonging to a specific entrant cohort, and historical period). Additionally, they can be observed over time and with changing starting positions on different analytical levels (e.g. work experience, labour market situation etc.) for the participation and the non-participation. On the other hand, this also holds true for the effects of further training since the very same person can be observed in the state of employment as well as unemployment after being laid off or having a different job or working for a different firm. In each of the studies, when using event history data, estimates with and without correction of sample selection bias (Heckman 1979) always lead to identical results (Becker and Schömann 2015). Because of the robustness of the results in the present case, we neglect the correction of socially selective participation in further training. The results of the empirical analyses are presented in three steps. In the first step, the development of further training activities in the occupational careers of birth cohorts is described. Next, multivariate analyses of the probabilities of participating in further training on the job are provided in a second step. Finally, in a third step, the consequences of further training on the subsequent career are analysed. 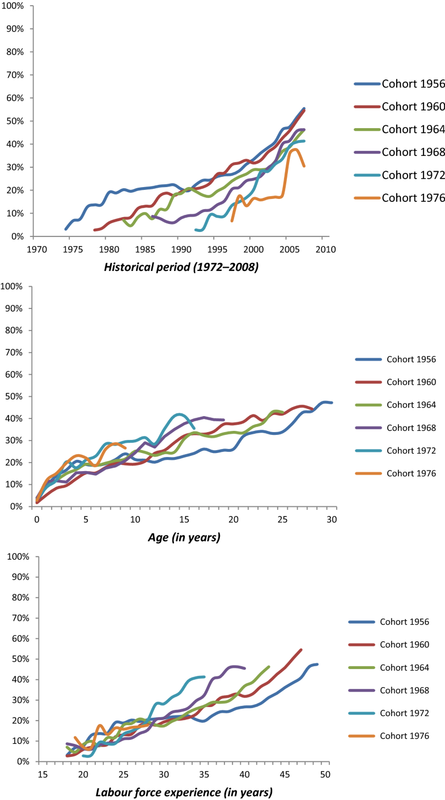 If the participation in further training is observed in terms of time (after the age of 18 years), distinct differences for cohorts become apparent (Fig. 2). While before the 1990s, older age groups show a larger degree of participation in further training than younger ones, younger cohorts tend to embark on further training courses much earlier in life. Therefore, in the succession of cohorts, the transition to further training on the job is accelerated. After the year 2000 the participation rate for age groups converge, which can be interpreted as being a consequence of a considerable increase in the firm supply of opportunities of further training for their employees (Autorengruppe Bildungsberichterstattung 2014). For a time period shared by all cohorts, the participation rate on the aggregate level equals the rate reported in other surveys (BMBF 2015). The differences for cohorts become all the more obvious when the development for age groups is observed. After the age of 30, the participation rate rises faster for younger cohorts than for older cohorts. This is probably because continuous vocational training for promotion, following vocational training or re-education, used to predominate (Jacob 2004). In regard to on-the-job further training, in which—compared to older comparable analyses with older cohorts (Becker 2018)—re-education and professional development for promotion are not included, there is no culmination point at which the inclination for further training fades. A similar development can be observed for labour force experience. After 10 years, the rate of participation in further training obviously increases for the younger cohorts and the differences between the cohorts persist. Employees’ inclination to engage in further training only declines for the two younger cohorts at the end of the observation period. All in all, though, these facts correspond to general observations in the longitudinal analysis on further training: namely, that further training—and especially further training courses within the company—has increased in importance in the past 15 to 20 years.12 . Which of the time-dependent factors influence employees’ participation in further training across their careers? Controlling for individual characteristics (e.g. gender), individual resources (e.g. educational attainments), the structure of respective job histories (e.g. previous job changes), and structural characteristics of the workplace (e.g. qualification requirements, position in firm), opportunities of further training (e.g. training leave, financial support) as well as labour market contexts (e.g. firm size) and industries (private vs. public sector), significant period and cohort effects of economic modernisation and labour market situation on further training participation are detected (see model 1 in Table 2).13 In line with hypothesis 1 predicting a positive impact of economic modernisation on employees’ participation in further training, it is found that the more pronounced the economic modernisation at the time of the graduates’ entrance into the labour market, the more likely it is that these employees will participate continuously in further training in their work history (cohort effect). The ongoing economic modernisation across historical time also results in employees’ significantly increased participation in further training on the job (period effect). Furthermore, there are cohort and period effects of labour market situations on the further training of employed workers. The less favourable the labour market situation (e.g. unemployment, failure of firms, etc.) at the time of labour force entrance (cohort effect) and across the employees’ career (period effect), the more likely it is that they will invest in further training on the job. In particular, when the labour market situation deteriorates employees are more likely to participate in further training than during cyclical upturns. This finding confirms hypothesis 2 predicting that, in an economic boom, there is obviously no necessity for employees to engage in further training in order to secure their employment relationship or to promote their career by additional costly investments in their human capital. It has to be noticed that the impact of period effects on participation in further training are larger than cohort effects. This means that employees obviously react immediately to the trend of modernisation and change in labour market situations, while distant conditions at labour market entrance mitigate across the time spent in employment. Finally, there are age effects on the participation in further training on the job (life-cycle effect). The greater the employees’ labour force experience, the more likely it is that they will participate in further training. However, the negative Gamma term (in model 1) indicates that this age effect diminishes significantly in the course of the employees’ career so that employees’ investment in further training decreases with increasing age. This is in line with human capital theory. One of the reasons for this is increasing productivity up to a certain threshold, and declining productivity in the employees’ life-course after this marginal value (Mincer 1962, 1974). The other reason is the decreasing time interval until retirement the participants have left in which to be compensated for their previous cost of further educational participation (Schömann and Becker 1995; Büchel and Pannenberg 1994). Do investments in further training on the job pay off, by, for example, minimising the risk of job loss due to being laid off? Do these investments contribute to flexibility in the labour market? Next, the question is addressed whether employees’ further training on the job and employers’ support of their employees’ professional development result in a more stable employment relationship. This is indeed the case (Table 3). Controlling for individual resources, structures of professional careers, structural characteristics of the workplace, the labour market contexts, and industry, as well as the trend of modernisation and change in the labour market situation depending on business cycles, previous investment in further training contributes to a more stable employment relationship. As assumed in hypothesis 7, participation in on-the-job further training reduces employees’ probability of giving notice (model 2), employers’ propensity to lay them off (model 1), and the probability of an employment contract being terminated by mutual agreement (model 3). Due to previous investments in firm-specific human capital, employers are obviously not interested in laying off participants in on-the-job further training. This is particularly valid for well-trained employees. If employers had invested in these employees by giving them training leave and financial support, premature dismissal would mean the employers missed out on the gains, while being left with the costs, of previous investments in human capital (model 1). In reverse, in a case where the employer released employees so they could participate in further training, or paid for them to do so, the participants are less likely to give notice or terminate an employment contract by mutual agreement (models 2 and 3). The (expected) gains of previous further training or repayment clauses might keep the employees from leaving the company (prematurely). It could be assumed that this is particularly valid for firm-specific further training since generally and vocationally educated and trained employees show higher probabilities of quitting the employment relationship (model 2) or for bringing about the consensual suspension of the labour contract (model 3). Finally, interesting time effects on these events are event even after controlling for employees’ participation in on-the-job further training, which itself depends on macro trends such as modernisation and change of the labour market situation. In line with human capital theory, the annulment of a labour contract becomes more unlikely with employees’ increased labour force experience (models 1, 2, and 3). Furthermore, the fact that the employees’ dismissal by the employer do not depend on structural changes, such as economic modernisation or labour market conditions, is compatible with human capital theory provided that employees’ human capital, such as formal qualification or continued qualification, is taken into account (model 1). From the viewpoint of this theoretical approach, on the one hand, it is rational for companies not to dismiss well-trained and experienced employees but rather to dismiss less qualified workers if necessary due to economic reasons. On the other hand, it is rational for employees to quit their job only in periods of favourable labour market conditions (models 2 and 3), while employees who have entered the labour market in periods of a pronounced level of modernity are less interested in terminating the labour contract (models 2 and 3). Overall, as previously shown, for terminations on the part of employers or employees, employees who have undergone further training have a clear advantage compared to non-participants, even when it comes to other forms of termination of the employment relationship. Participants in further training have lower unemployment risks, lower job-search costs, lower job insecurity, and obviously more stable careers. In a final step, this last assumption will be subjected to empirical testing in the following section, using information on change of professional activities and employer in the course of the occupational career. Controlling for individual and structural characteristics, the rate of job changes in terms of workplace or professional activities, obviously enforced by the substantive trend of economic modernisation (period effect) but reduced by increased labour force experience (life-cycle effect), is higher for participants in on-the-job further training than for non-participants since preparing for enhanced and sophisticated professional activities might be one of the causes for this further training on the job (model 1 in Table 4). While this finding confirms hypothesis 5 about the positive effects of participation in further training on employees’ probabilities of changing their jobs, it is revealed that employers’ support of their employees’ engagement in further training (training leave or financial support) result in decreasing rates of job changes. According to human capital theory, this can be explained by the high degree of job relation of this further training and the pronounced firm specificity of this arrangement (see e.g. Becker 1993). According to hypothesis 6, it is found that the probabilities of changing employer are lower for participants in on-the-job further training than for non-participants (model 2). Due to their firm-specific human capital, they are less interested in changing, or less able to change, their firm. In particular, this is true in a case where their further training has been organisationally or financially facilitated by the employer. The employees’ obligation to repay the employers’ cost of further training courses if they leave the company might strengthen participants’ commitment to the firm. Controlling for their general and firm-specific human capital, it is also in line with human capital theory that employees are more likely to change firms only in periods of favourable labour market situations. In particular, in the course of economic upturns, they might be more likely to have access to jobs in other firms that provide increased benefits for their previous human capital investments, as well as an appropriate fit for their qualification, than in periods of economic downturn. However, in times of pronounced modernisation (indicated by cohort and period effects), the likelihood of changes of firm in individuals’ careers is rather low since firm-specific human capital and firm specificity of professional activity might become increasingly important. Overall, this development might result in increased long-term commitment of well-trained and highly specialised employees to their employer. The procurement of firm-specific human capital thus lowers professional mobility in labour markets. In the research on labour markets and employment, it has often been assumed that economic modernisation, in terms of technological, industrial and professional change, the cyclical developments of the labour market situation, and the sinking value of formal initial training force employees to perpetually engage in professional development and, particularly, in further training on the job (Mayer 2000; Acemoglu 2002; Goldin and Katz 2009; Becker and Blossfeld 2017). The aim of the present sociological contribution was to subject these assumptions to empirical testing from the dynamic perspective of life-course research and by a multi-level analysis of life-cycle, period, and cohort effects of economic modernisation and changing labour market situation. The question of whether further training in an employment relationship factually contributes to continuous employment and stability of occupational careers in the face of ongoing economic modernisation and cyclical labour market situations was also the subject of analysis (see also: Mayer et al. 2010). To the best of our knowledge, this study is the first dynamic multi-level analysis to have considered the effects of structural change at the macro and meso level on both the training trajectories in individuals’ work history and the effect of further training on occupational trajectories at the individual level by taking into account economic modernisation, as well as the labour market conditions, in the course of the economic cycle. In this respect, by combing time series of official statistics with event history data for a period of about 40 years, an innovative approach and design to empirical research on further training and its consequences for the consecutive career has been employed in order to reveal proximal and distal effects of structural change on employees’ and firms’ investment in further training. For the empirical analysis, longitudinal event history data of the ALWA survey on employees in West Germany born between 1956 and 1978 was used. For the 1972–2008 period, this unique data set enables the dynamic analysis of the time-dependent effects of the modernisation trend and the changing labour market situation—at job entry (cohort effect) and in the course of an occupational career (period effect)—on participation in (on-the-job) further training during an employment relationship, and its time-dependent effects on the subsequent career by taking the employees’ labour force experience (life-cycle effect) into account. Overall, the empirical findings contribute to an understanding of how the modernisation trend and the development of labour markets affected by business cycles have an impact on occupational careers, being one of the most important areas of the life-course. In particular, they support the main arguments of an enlightened version of the human capital approach regarding the probabilities of continuous vocational training participation, as well as the probability of effectively profiting from such participation. As a matter of fact, the economic modernisation—the change of the occupational structure in the course of tertiarisation and the professional activities in the course of technological change (Goldin and Katz 2009; Becker and Blossfeld 2017; see also: Schindler et al. 2011; Müller 1983), in particular—and cyclic developments of the labour market situation since the 1970s do indeed influence companies’ supplies of professional development opportunities, as well as employees’ propensity to take advantage of these opportunities and implement the acquired skills, both in the short- and long-term. The economic and professional structural change is doubtless an important reason for employees’ professional development endeavours. At the same time, companies react to shortages or oversupplies of the workforce while employees obviously closely observe developments in the labour market situation and the progress of qualification requirements in their job in the course of economic modernisation, and accordingly adapt their strategies in terms of further training participation. Overall, on the one hand, it has been found that, across their entire occupational career, employees’ inclination to engage in further education is positively affected by the trend of pronounced economic modernisation, as well as by the deterioration of the labour market situation after a period of economic boom. On the other hand, in regard to organisational and financial support of their employees’ further training on the job, companies’ strategy is mainly oriented—for economic reasons—toward the proximal business cycle and related labour market conditions. Unfavourable labour market conditions in the course of an economic downturn, however, hinder companies’ engagement in further training, and they invest mainly in further training during the recovery of the labour market situation after a period of economic recession. 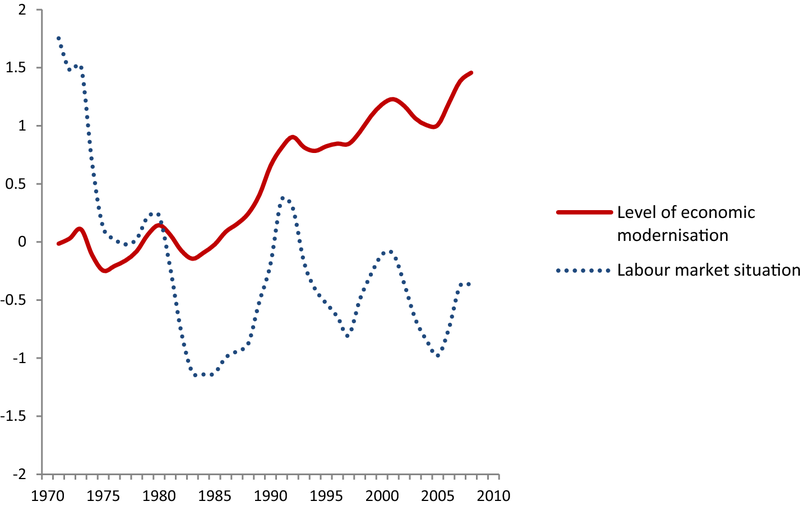 If the labour force supply and the organisational structures of companies are taken into account, the process of economic modernisation obviously has no significant effect on companies’ supply of further education arrangements. The empirical findings also show that participants in further training have lower probabilities of being laid off than non-participants. The former are also a lot less likely to terminate an employment contract. Compared to employees without further training, those who have engaged in professional development have considerably lower risks of premature termination of their employment relationship. They are more flexible in the labour market, unless their employer had either organisationally or financially supported their further training. In the case of internal further training, commitment to the firm is increased at the cost of employees’ job flexibility (Becker 2018). Furthermore, so far unknown relationships in regard to individuals’ inclination to participate in further training activities, as well as the consequences thereof in regard to job mobility and employment security, are revealed. While social selectivity in regard to access to continued vocational training on the job and the accumulation of unequal educational and career opportunities has been discussed in many sociological studies (e.g. Becker 2018), this study reveals some of the mechanisms behind these processes. It should be noticed that there is a complex and, in particular, time-dependent interplay between individual characteristics (micro level), structural characteristics (meso level), and societal developments (macro level) (see also: Becker and Mayer 2019; Becker and Blossfeld 2017). This interplay reflects the reaction of the individual and corporate actors to the changing contexts in which they are embedded. Employees, as the ones directly affected by changes in the economy and employment structures, react to these changes before companies do, which is partly due to the structural inertia of these organisations (Hannan and Freeman 1989; Carroll 1984). On the one hand, organisations “interpret” the individual characteristics and efforts of their employees (e.g. educational level, trained profession, work experience, gender etc.) (Haveman and Cohen 1994; Baron and Bielby 1980; Stolzenberg 1978); they also convey continued training opportunities (Becker 2018), as well as employment and career opportunities (Blossfeld 1986, 1987a) as an effect of organisational reactions to structural change and through effects on competitive positions. All in all, the empirical findings allow the conclusion that the economic and organisational logic of firms, industries, and labour market structures has a large influence on the probability of employees engaging in further training throughout their work life and—as a consequence of their further training in paid employment—their probability of staying with the same employer over a long period, or of successfully changing to another company. Of course, it is still unanswered whether the participation in further education or the structural changes in terms of modernisation have had a direct effect on status mobility in the occupational career. Have the probabilities of upward and downward occupational mobility changed across the period? Is continuance in a job position or changing employer associated with improved careers in terms of earnings, prestige, social class, and working conditions? What are the roles of societal change as a whole and the ecological dynamics of labour markets, companies, and industries? In future research of continuous vocational training and occupational careers, these unresolved issues should be investigated by taking the sociological programme of life-course research (Mayer 1990, 2015), the sophisticated rational action theories (Blossfeld and Huinink 2001), and the idea of mechanism-based explanation (Hedström 2005) into account. As demonstrated in the empirical part of this contribution, the embeddedness of individual and corporate actors in different and changing societal contexts across their life-course could be considered by reference to the macro-meso-micro linkage (Coleman 1986, 1990)—something that has been accomplished by a dynamic multi-level analysis of real longitudinal data for a rather long historical period (Blossfeld 1996). Taking economic cycles and changing labour market situations into account, the trend of modernisation results in increasing participation in continuous further education and training on the job. Investments in such further training across the career contribute to participants’ stability of employment and their job security. On-the-job further education and training provide participants with higher job change rates and a higher likelihood of sticking with the same employer. Apart from a few exceptions (e.g. Becker 1991; Schömann and Becker 1995; Becker and Schömann 1996), only very short historical periods have been analysed, concerning participation in, and the effects of, further training (e.g. Wolter and Schiener 2009; Büchel and Pannenberg 1994). On the one hand, in order to assess the role of economic cycles and structural change for further training and professional careers, it is important to choose historical observation time windows which cover the longest possible time slots (Blossfeld 1996; Becker and Schömann 2015). On the other hand, Fitzenberger and Völter (2007: 750) demonstrate that further training arrangements often provide positive middle- and long-term effects that are overlooked by employing cross-sectional data or considering only a small ‘observation window’ in a panel design. However, in order to reveal these effects and to evaluate their sustainability it is necessary to choose a large historical period for the time-continuous observation of both the participation in, and the consequences of, further training (Lechner 2011). Continuous vocational training or firm-specific further training or more general training acquired outside the firm is defined according to Mincer (1962) or Büchel and Pannenberg (2004: 76). This definition includes professional courses and seminars for employed persons and, as such, non-formal or informal learning activities as defined by the OECD (2012). Here, these learning activities are considered as part of an existing employment relationship which aims to increase work productivity or prepare employees for new tasks (before or after an internal transfer). This includes refresher courses that aim to adapt to technological innovation so as to satisfy the requirements of new work processes, or further training that aims to broaden existing knowledge or familiarise employees with firm-specific production processes. Another example of further training as a “specific form of human capital investment throughout the life course” (Fitzenberger and Speckesser 2004) is the learning of new professional know-how. For reasons of profitability, larger companies are more likely to be prepared to partially or completely cover the training costs of their qualified employees, compared to small firms (Weiss 2011; Dietrich and Kruppe 2009; Schweri e al. 2003; Büchel and Pannenberg 2004: 78; Hübler and König 1999: 263; Düll and Bellmann 1998, 1999). That means they are more likely to be able to share the costs of further training with their employees, who have to invest in time and effort for further training participation within the firm. The data are historical since they do not capture processes in the individuals’ life course from 10 years ago up to the most recent point in time. On the one hand, we have learnt that societal change in terms of economic modernisation was rather constant in the post-war period in West Germany (Becker and Mayer 2019; Becker and Blossfeld 2017; Blossfeld 1986). On the other hand, from the perspective of life-course research, we are interested in structural regularities, including the main social mechanisms behind them, but not in historical singularities (Blossfeld 1996). The event history data meets our requirements and it is possible to make evidence-based prognoses for the period after 2008 (Blossfeld et al. 2007). Finally, another advantage of this data set has to be emphasized. In contrast to cross-sectional data and most of the panel studies, the observed life courses in the ALWA data set are not left-censored. However, right-censored episodes could be analysed by the statistical procedures of event history analysis in order to predict the likelihood and timing of future events in the individuals’ life course (Blossfeld and Rohwer 1997). However, so called telescoping effects can also be observed in other retrospective surveys on further training, such as the German Socioeconomic Panel (Schömann et al. 1997) or the micro census in Germany (Reimer 2005). The aggregate results of the ALWA data on participation in professional development are consistent with those of other studies on further training (see e.g. Becker 2018). Therefore, the methodological reservations are not only valid for life-course data. This procedure is as plausible or problematic as the typical procedure in cross-sectional panel designs, in which interviewees are asked for information on their participation in professional development in the past without exact time specifications. The timespan enquired about ranges from, e.g., 12 months in official reports on further education and training for the Adult Education Survey 2012, to 3 years in the German Socio-Economic Panel and micro census, or even 5 years in the Employment Survey by the Federal Institute for Vocational Education and Training (BIBB), or in an earlier survey conducted by the BIBB and the Institute for Employment Research in Nuremberg (IAB). The mixing up of multiple or different further training courses is as much subject to problems concerning the analysis of participation and its consequences in these cases as it is in the present paper (Eisermann et al. 2014; Becker and Schömann 2015). According to this economic concept suggested by Weber (1978: 928), four major social classes can be identified under capitalism. The working class includes family workers, farmers with less than 10 hectares of land, unlearned and semi-skilled workers, employees with mundane jobs (e.g. sales), and lower civil service workers. The lower middle class includes skilled workers, foremen, and self-employed persons with no more than one employee, as well as farmers with less than 50 ha land. Master craftsmen and industry masters, employees in qualified positions (e.g. clerks), those in middle civil service, the self-employed with up to nine employees, as well as farmers with more than 50 hectares land belong to the (middle) middle class. The upper service class consists of highly qualified employees and professionals—e.g. those in management (e.g. general manager), higher civil servants (e.g. judge), academics (e.g. doctor with own medical office, lawyer), as well as self-employed persons with at least 10 employees. Since in the ALWA dataset information on company size is only available in a categorised form, the nominal company size was computed by applying random process for each category. If, for example, it was declared that a company encompassed 100 to 199 employees, a number in this range was selected randomly and used as company size. In regard to participation in further training courses, it could be assumed that older employees could be more threatened by economic cycles and technological changes than younger workers. Given that technological change dominates the supply and demand for further training in the 1970–2008 period, a positive correlation between age or labour force experience and participation in further training courses has to be assumed (see also: Bills 2005: 74). The time series were compiled from the statistical yearbooks of the Federal Office of Statistics in Wiesbaden (http://www.destatis.de) and the German System of Social Indicators (http://www.gesis.org/en/services/data-analysis/social-indicators/), available from GESIS–Leibniz-Institut für Sozialwissenschaften (Gesellschaft Sozialwissenschaftlicher Infrastruktureinrichtungen). For this service, I would like to thank Adrienn Làzàr. However, it has to be noticed that the estimation of these period effects could be somewhat biased due to the estimated, instead of exactly measured, starting time of participation in further training on the job. In particular, this might be true for enduring job spells. The already mentioned telescoping effects cannot, however, be ruled out (Reimer 2005). This is also true for previous surveys with retrospective interviews for both longer and shorter time periods. However, differences in the participation rates for cohorts—as observed here for work experience—contradict the assumption that this development is only an artefact of memory. Intensive robustness checks indicate that these time effects are stable and there seems to be no problem of non-stationary of time series. As predicted by human capital theory, selectivity by education indicating trainability can be observed. This is why better educated employees, i.e. employees holding jobs with higher qualification requirements and employees in higher positions in the company hierarchy, have the highest probabilities of engaging in further training. For these groups investments in internal further training seem to be more efficient and effective. Furthermore, labour market characteristics influence the probability of participating in further training. Employees in the private sector are more likely to participate in on-the-job further training than employees in the public sector. Additionally, opportunities for further training increase with firm size. There is just a single author. The author read and approved the final manuscript. For helpful comments on previous versions I wish to thank Walter Müller, Felix Wolter, Felix Weiss and, in particular, Jürgen Schiener. The ALWA dataset is available at IAB research data centre (http://fdz.iab.de/en/FDZ_Individual_Data/ALWA.aspx). Some of the times series used for analysis are stored in the German System of Social Indicators and Historical Time Series hosted by GESIS (http://www.gesis.org/histat/en/index). Another source is the time series by Rahlf (2016): Zeitreihendatensatz für Deutschland, 1834–2012. Köln: GESIS Datenarchiv (ZA8603, https://doi.org/10.4232/1.12202). Finally, some data has been gathered from the Federal Office of Statistics in Wiesbaden (https://www.destatis.de/EN/Homepage.html). There is no external funding.